Like other inflatable beds, the Campeggi Ca.Mia packs into a compact bundle, allowing you to stash it in a closet shelf for storage or pack it in a bag for easy portability. 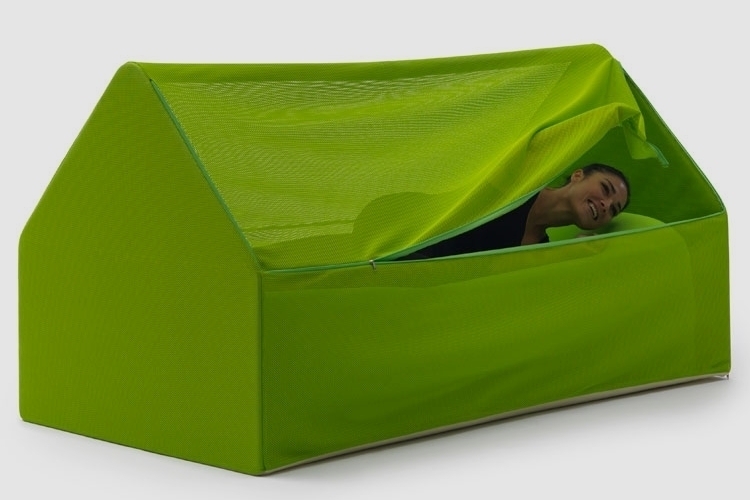 Unlike them, it inflates into couch-like structure with an integrated tent, so you can sleep in your own private space even in the middle of a busy room. Designed by Denis Santachiara, the bag collapses into the size of a small tote bag, making it easy to bring along anywhere as an emergency bunk. 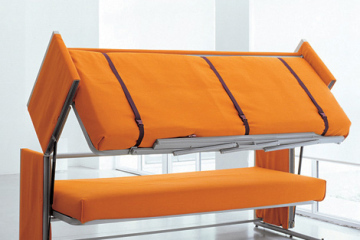 Need a comfy bed for short naps when working round the clock at the office? This should do the trick. 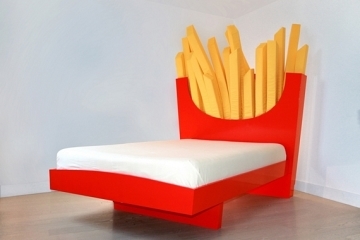 Want a weird-looking bed to bring to camp for the heck of it? We’re not sure how it works outdoors, but you definitely can try. The Campeggi Ca.Mia inflates into a shape similar to a small house, making for an aesthetic that should blend in better than traditional mattresses in any room of the house. At the least, having this thing inflated in the living room won’t make your house look like you’ve got visitors sleeping on your floor. Thin fabric wall panels on either side of the bed allows you to enjoy privacy while allowing light through, so you don’t have to feel like you’re buried underground while trying to catch a nap in it. Check out more details about the Ca.Mia directly from Campeggi’s website. 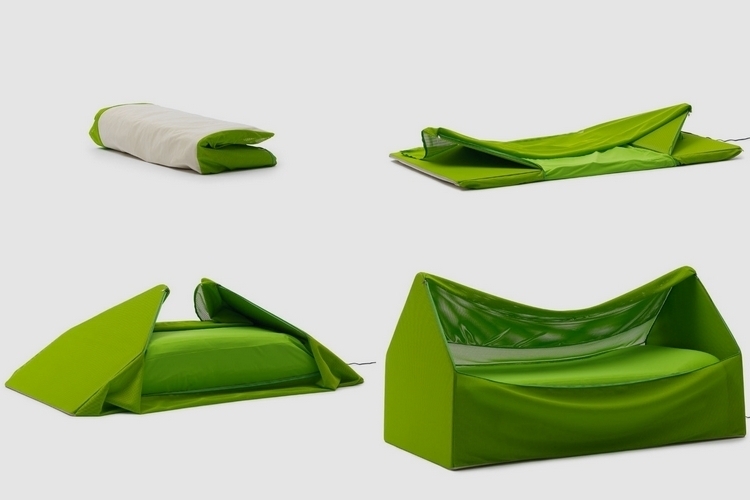 Awww…and inflatable crib for adults.! LOL. It looks cute, but how functional is it? It looks short. I bet I am too tall to sleep on it. I don’t really know because their website doesn’t have too many details. I do like the idea of it, but I’ll have to pass. How much weight can it hold? How long is it? What is the pack weight of this when it is not aired-up? I wont even consider ordering one fo these until they put up more details on the website about it. It seems strange that they haven’t add the basic stats of the air bed in a box setup. 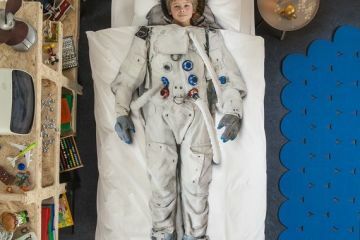 Although this probably wont work for me, I bet kids would really enjoy playing with it and sleeping on it. 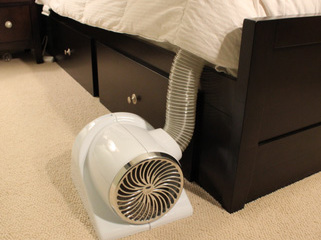 This would be great for when you plan on spending the night at a friend’s house and say they don’t have a guest room. You could feel safe and secure in your own private little space and then fold up your bed and take it home with you. I really like this. I’m shocked that it can fold into the size of a tote bag that is extremely small! The idea of bringing this into the office is a bit on the strange side but I could see where that would be useful if you had work to do late and you didn’t want to drive all the way home afterwards. 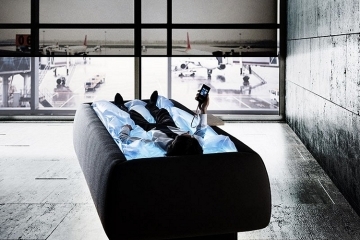 I may get one of these for our garage, which we double as a relaxation space for movies and a place to get away. I really like the Campeggi Ca.Mia! It’s perfect for when family comes up to visit! I only have one guest room, so there’s no good way to share it but with the Campeggi Ca.Mia I can totally make it work! I’m not sure how comfortable it is, but I am willing to buy one and give it a try. If it’s a hit then I would buy two or three more. 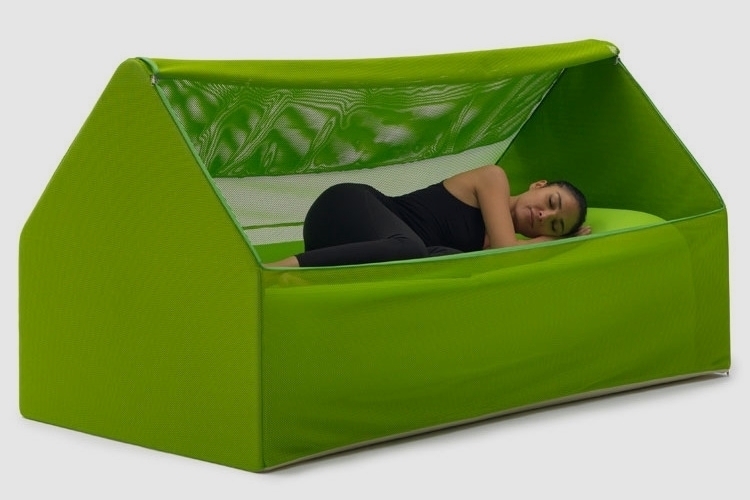 Unfortunately this inflatable bed is still ‘coming soon’ on Campeggi’s website. I hope it comes out before the holiday so I have a spot for everyone for Thanksgiving and Christmas time. At least now the kids can go out and camp in the backyard if they wanted to. Maybe it’ll come in different colors too because the it’s a little loud for my current décor.